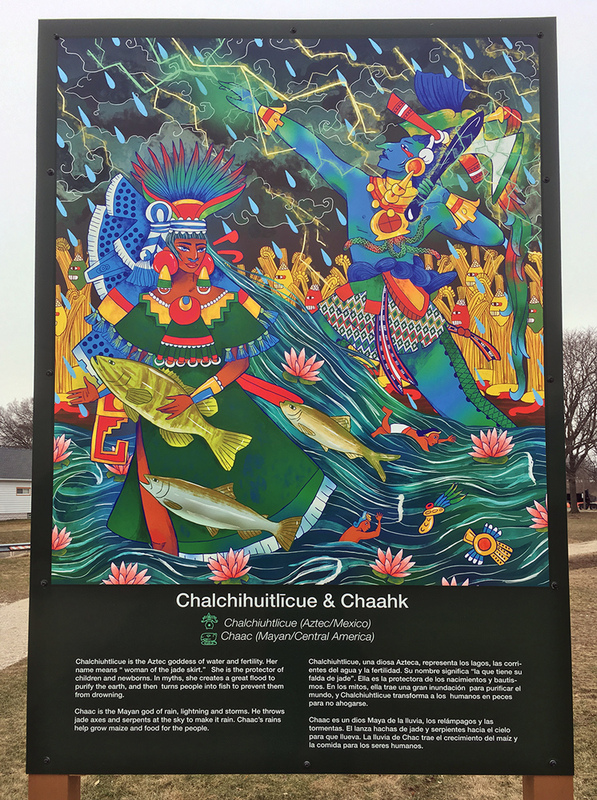 River gods and goddesses from many diverse cultures have appeared near the Kinnickinnic River on Milwaukee’s south side, as if to applaud the restoration work being done along the beleaguered waterway. More about the sudden appearance of deities in a moment. First, an update on the restoration in progress. 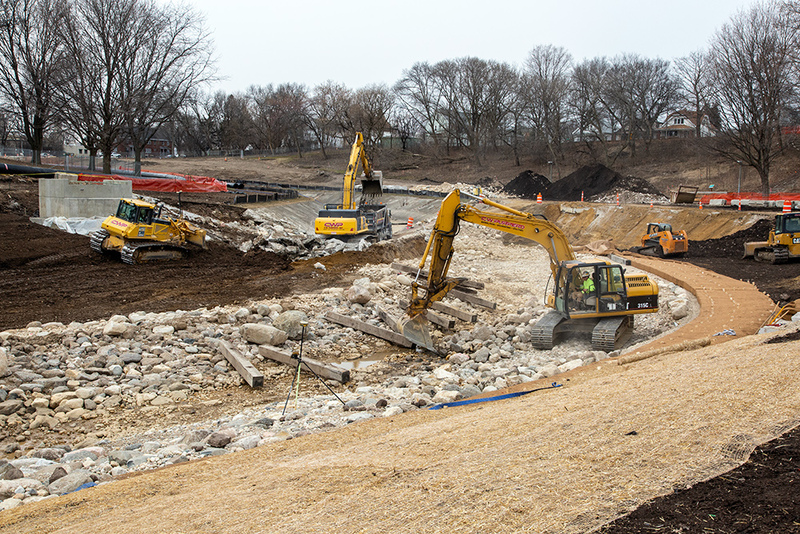 The current phase of river restoration is in Pulaski Park, at 16th Street and Cleveland Avenue. The park is even more torn up than when I last visited in December. You may recall that the Kinnickinnic River has been straightjacketed with concrete for over 50 years. An effort to remove the concrete channel is now well underway. Despite the chaotic conditions, progress is visible. The old, cracked channel is being removed in sections. As each section is removed, a new, wider and more natural-looking channel is being dug and lined with river rocks. The wider watercourse will accommodate projected storm water volumes and slow down the flow of water. 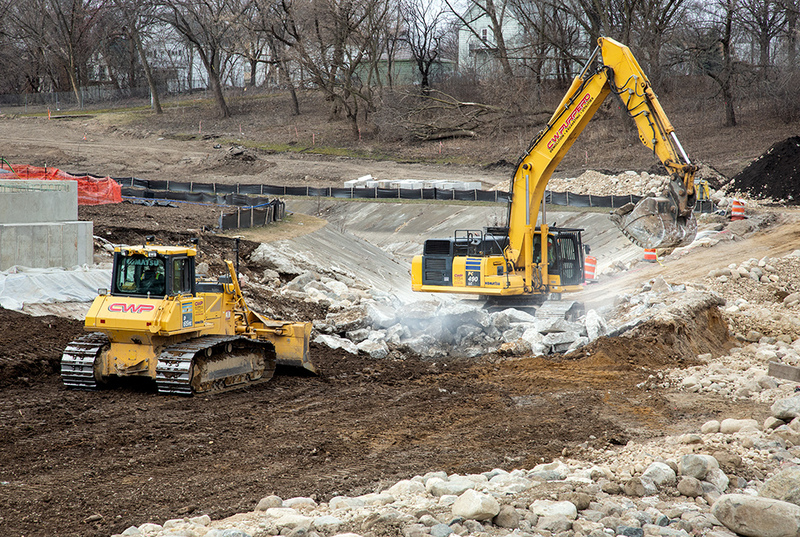 In this view you can see three actions simultaneously: a shovel removing the old concrete, another shovel placing river rocks along the new channel, and a bulldozer smoothing fresh topsoil over the old channel. Originally, the concrete was intended to reduce flooding. While that may have worked for a time, it also degraded water quality, destroyed wildlife habitats within and along the waterway and increased the threat of drowning. Now, even the original intent of the channel is no longer effective due to 50+ years of continued development within the KK watershed, which has seen the floodplain rise dramatically and a consequent increase in flooding. 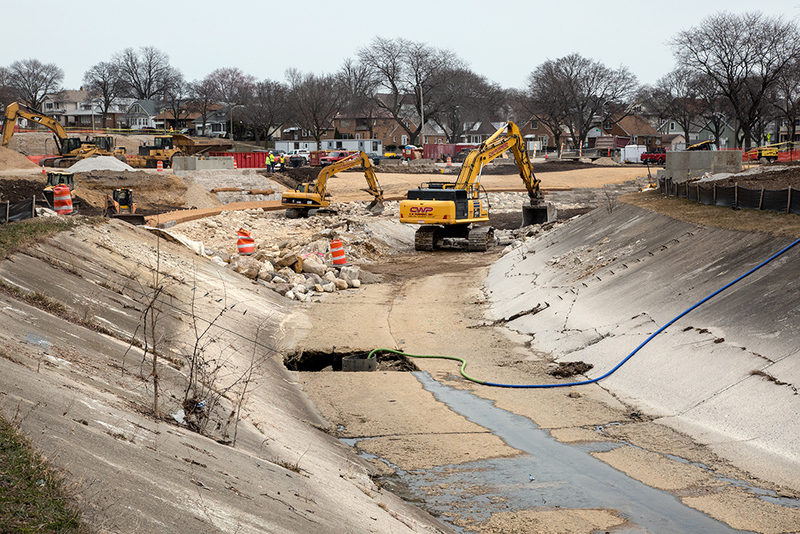 The current phase of restoration is part of a multi-year, multi-pronged project spearheaded by the Milwaukee Metropolitan Sewerage District and Sixteenth Street Community Health Center called the Kinnickinnic River Corridor Neighborhood Plan. In addition to removing the concrete channel—eventually on several miles of the river from Sixth Street to Jackson Park—the plan involves removing houses from the floodplain, a process I’ve written about previously. The Pulaski Park phase of the project is expected to be completed sometime in 2019. 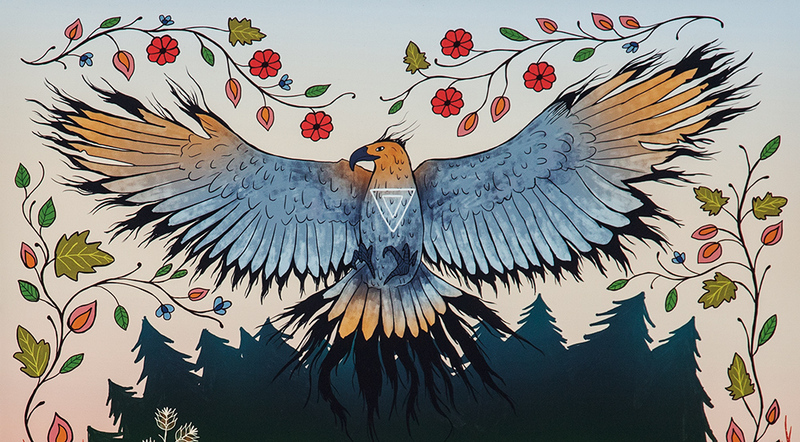 Six large, intricately detailed and stunningly beautiful panels have been erected along the trail as a public art project sponsored by Sixteenth Street Community Health Center, The Haggerty Museum of Art, and KK River Neighbors in Action. 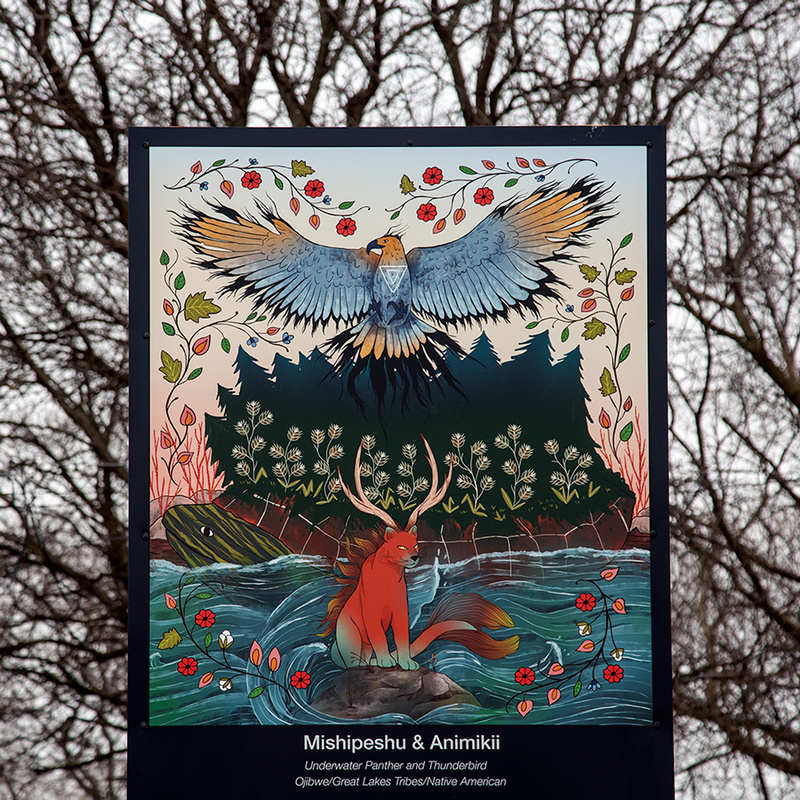 The installation, entitled Here Lives Our River Gods/Nuestros Dioses Viven En El Rio, is by Milwaukee artist Gabriela Riveros, who identifies as Paraguayan-American. 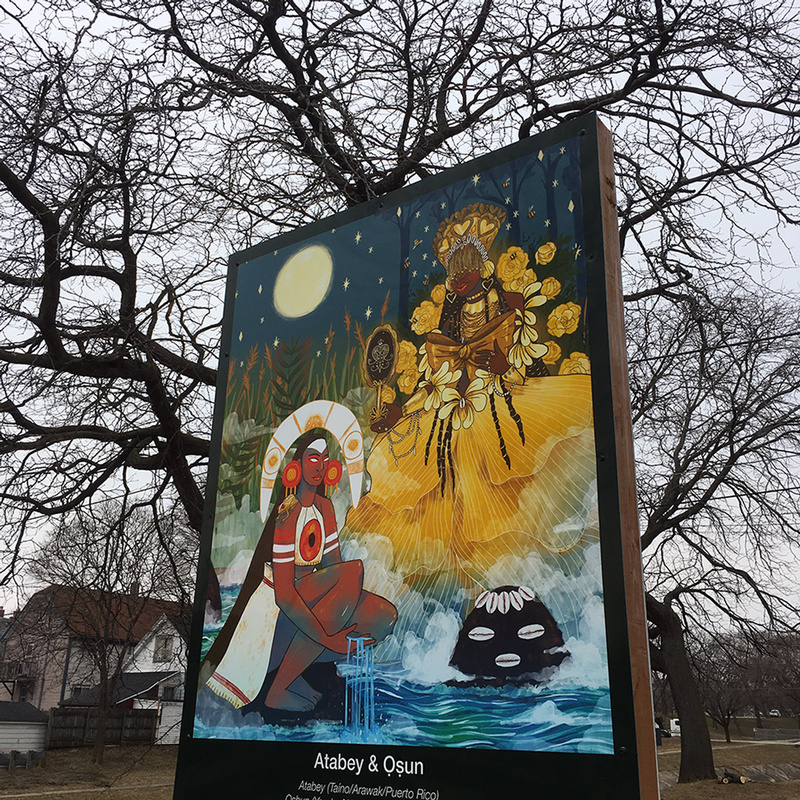 Each panel depicts a pair of water-related deities that represent cultures with a history in the neighborhood. How excellent is that! WaterMarks, a major artistic and cultural endeavor associated with New York artist Mary Miss, provides opportunities for community members and residents to explore their neighborhoods through the perspectives of local artists and scientists. Walk participants are encouraged to become active partners in recognizing water as a resource that is vital to the well-being of their community. 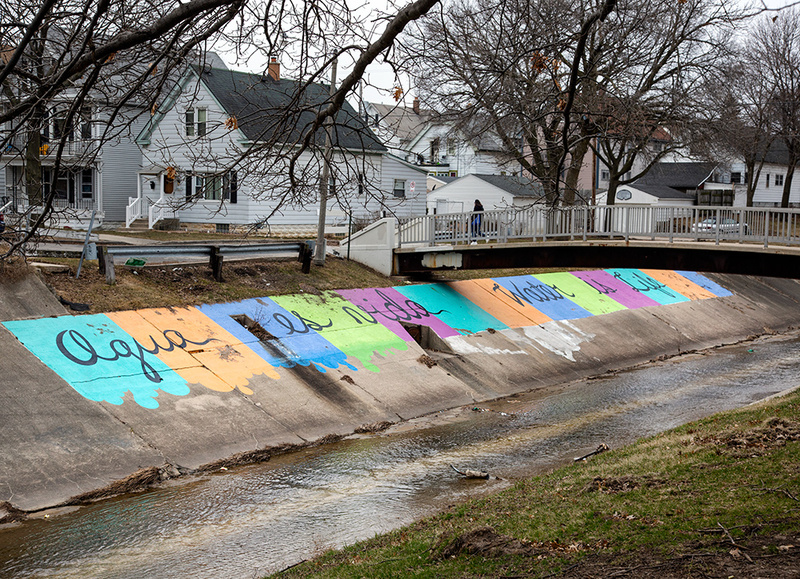 The artists create public art that emphasizes connections between Milwaukee’s people, its land, its lake, and its rivers. The new gravel trail and art installation are temporary improvements intended to reclaim this stretch of the riverside for the community in advance of future phases of restoration through this corridor. However, the art will be reinstalled once the restoration work is completed. Is it just me, or are the river gods smiling on our community, which has chosen to make the slogan—Water is Life—ring true again for the KK River? Eddee Daniel is a Preserve Our Parks board member and project director for A Wealth of Nature. See previous images of the KK River on his website portfolio: Concrete River. MMSD is a project partner to A Wealth of Nature.